Designed to accommodate a MacBook Air to a 17-inch MacBook Pro, the BookArc stand helps you to free up desk space by turning your laptop into a desktop. The product page goes on about the benefits of running your MacBook closed when using an external display and whatnot, but the bottom line here is that it elegantly orients your laptop vertically. If you use an external display at home with your laptop and you don't mind spending $50 on a stand, you can get one now at an Apple Store near you. Charleston, SC—August 25, 2009—Twelve South announces the formal release of BookArcTM, a metal stand designed to hold any Apple® MacBook, from MacBook Air to the 17-inch MacBook Pro. The stand is designed to free up desk space and create a cleaner, less cluttered workspace by allowing the MacBook to operate while in a closed vertical position. BookArc is available now at the Apple Store and retails for $49.99. A BookArc "six-pack" geared towards design studios and Mac-based offices is being offered at a bundled discount price of $249.99. More information and images can be found at http://twelvesouth.com. When a MacBook is placed into the heavy gauge steel stand, it is held in place by a soft silicone cushion. Three different sizes of easy-to-install cushions are included in the box, ensuring the right fit for various Mac models. Silicone footpads also protect the surface of your desk from scratches. BookArc has a compact footprint of just 10 by 4 inches, a fraction of what a MacBook normally takes up when sitting on a desk. "Our vision behind BookArc was twofold," said Andrew Green, co-founder and design principal of Twelve South. "First, we see the MacBook as a beautiful piece of art that deserves to be put on display. Second, using your laptop as a desktop when not on the road is how many Mac users work today, including myself. Running the MacBook in a BookArc tucked behind a beautiful Cinema Display frees up valuable space and provides a less cluttered modern-looking workspace." 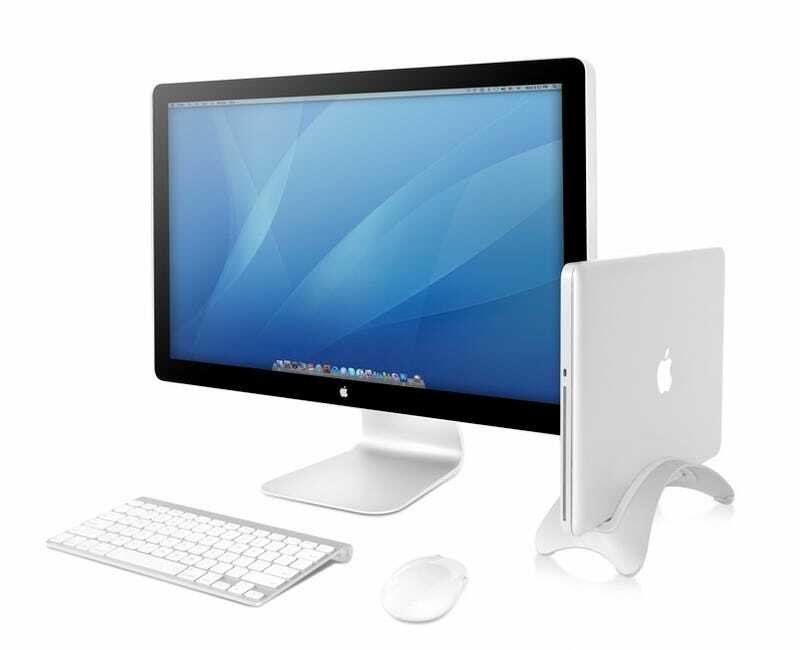 Along with a contemporary design and improved ergonomics, BookArc can actually boost the performance of MacBooks when used with external monitors. When a MacBook is running closed in the BookArc, the MacBook will automatically dedicate 100% of its video memory to the external display - instead of splitting it with the built-in display. The result is a noticeable speed increase when working in Photoshop, Aperture, iPhoto and other graphics-intensive applications.